In recent weeks, it has become apparent to me that the external temperature sensors on Nibe* heat pumps are very prone to the effects of the Orkney weather. 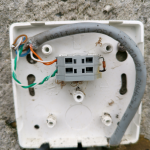 The image to the right shows the internals of a typical Nibe outdoor sensor that is suffering from the ravages of the local Orcadian weather. These sensors are critical to the correct operation of the heat pump and its failure can cause incorrect operation or total deactivation of the system as a whole. These sensors fail in one of two ways. Firstly a total component failure results in the Nibe heat pump going into a fault condition. In this state, the heat pump ceases to operate. The second failure condition causes the heat pump to incorrectly measure the outside temperature. With this sensor reading the wrong outside temperature, the heat pump then incorrectly adapts its operations based on the incorrect external temperature and then incorrectly adjusts its output levels. This will result in the internal property temperatures being wrong and the likely hood of increased electrical consumption. If the persists for a long time, the house will be heated incorrectly and will almost certainly result is much larger energy bills for the bill payer. The second failure is much harder to identify to the average property owner, as no fault will be indicated by the Nibe heat pump itself. And as such, can only be identified correctly by an experienced engineer. The picture shows the internal of a Nibe sensor. In the centre there is the connection block. The wires, in this case, are attached to the left hand side. On the right hand side of the block is a small glass cylinder (only about 1mm x 3mm). This glass cylinder is the sensor itself. With the sensor cover on, everything is protected from damage by even reasonably small items. However, because it needs to measure the temperature of the air outside, there are vents that allow the air to move freely in and out of the case. It is this passage of air, containing salts from the sea, that affects these sensors directly and degrades their quality. Because of production costs of modern components, the leads (wires) are now manufactured from tinned, coper coated steel (CCS). These leads, in normal circumstances will provide many, many years of satisfactory operation. However, in Orkney, where the wind and rain are contaminated with salts. And this seriously reduces their operational life. Originally these component leads would have been solid copper, which is then tinned to protect them. Steel corrodes very easily in Orkney and so these sensors have a much shorter life. Component failure effects can start to take place in less than 5 years after installation. If you look carefully at the image above (click on it to display a larger version), you should notice that lower lead from the glass sensor is badly corroded. The upper lead is in much better condition, but it is already starting to show corrosion effects. Actually, when I attempted to take this sensor out, the lower lead just crumbled away to nothing. And in this case the heat pump was operating without a fault condition, but it was operating incorrectly. The faulty sensor was replaced, not by replacing the entire sensor assembly (typical cost for the entire sensor box is around £85 + VAT). But by replacing the glass sensor itself at a significantly lower cost. It would appear that this sensor should probably be replaced on a short schedule interval. This could be during the annual service, or some multiple of this time frame. I would suggest that the sensor is replaced within a maximum time frame of 5 years. Annually is perfectly viable due to the cost of the sensor itself (compared to a entire sensor box). The sensor itself can be replaced cheaply and sensibly by anyone competent in basic DIY wiring and the correct basic tools. These sensors are also used on Bosch and Worcester heat pumps and suffer from the exact same faults. You will need to specify the make and model of your heat pump (either Nibe, Bosch or Worcester), along with details of whether your are the home owner or a qualified service engineer. I have investigated various methods to protect the sensor leads against the corrosion. 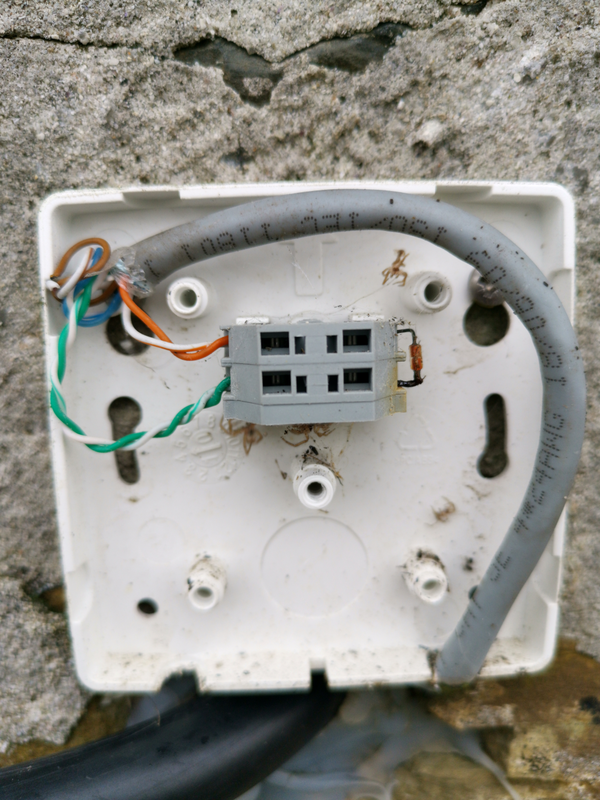 However, this has to be cleaned off to allow the electrical connection to the wires back to the heat pump. Otherwise the sensor does not work, or it reads incorrectly again. Cleaning the protection off again leaves the leads sensitive to corrosion. So there is no satisfactory way forward that I can identify that protects the leads from corrosion, but also allows the sensor to operate correctly. Changing the sensor on a suitable replacement interval, before corrosion affects operational performance is the only sensible solution at this time. Copyright © 2019 ThreeOrbs Specialist Services. Proudly powered by WordPress	& Personal Portfolio WordPress Theme by Dinozoom.com.